James Madison outlined a new plan for a Constitution in Vices of the Political System of the United States. James Madison, as stated before, is credited with being the “father of the Constitution.” It is rightly so when one takes a look at his Vices of the Political System of the United States, which later was adopted as the Virginia Plan. Leading up to the Constitutional Convention, James Madison outlined some issues he felt should be addressed. This essay of his was more than just a revision of the Articles of Confederation. It was to be a plan for a new government. It should be noted that James Madison fully understood the short-comings of the Articles of Confederation. So much in that he wished to address them one by one in this outline. It is referred to as an outline because that is how he wrote it out. On the left side of the paper was written the general topic, while on the right he expressed his thoughts in full detail. These thoughts helped bring forth what we know our government to be today. It gave a whole new structure to government. It laid out the three different branches being: Judicial, Executive, and Legislative. It separated those powers, and limited their scope of operation. It also dealt with the states being equally represented. Another issue facing the states was how they worked together, or the lack thereof. It helped unify their cause and protection, not only of the states, but of the people. And that is where things differ from how things operate in Washington today. At that time, the people had a say. That’s not to say that the people of today don’t have a say. But, they were heard and represented more fully because the elected were from and of the people. Washington today is so disconnected with the people, that they often forget these basic traditions. Maybe if they understood the history of this nation, where it came from, and what went in to making it so great they might change their ways of doing business. Thomas Jefferson’s 1784 book, Notes of the State of Virginia, addressed the problems of Virginia’s first attempt at being self-governed. At its start, Virginia was the leader of the pack, and so was Thomas Jefferson. Virginia had already adopted a state constitution, and a governing body before pretty much everyone else did. They were the trailblazers of the time. Along their side was a governor who would help elevate their status, and continue to put them at the forefront of the happenings. That man was Thomas Jefferson. He served as the governor of Virginia from 1779 to 1781, and latter became President of the United States. Well, being the first out of the gate has its challenges. The main problem was that they didn’t have anything else to look upon when drafting their beginnings. They were the pioneers setting forth a path that would be followed by other states, as well as the nation, for years to come. Did they have shortcomings? You bet. And, Thomas Jefferson addressed some of those problems in his 17984 book titled: Notes on the State of Virginia. There were several things that were addressed, but some of them were the lamps in the room illuminating things to come. Things such as equal representation. Smaller, limited government. A government led by the people. Separation of powers. These were just a few of the things that were not fully addressed by the constitution of Virginia. However, they were some of the most important issues. Issues that would soon find their way to a nationally adopted Constitution. Before the Constitution, the states were the governing body. While they all had begun to adopt their own ways, it was up to the national government to bring the necessary unity. That came in form of the Constitution. And, many of the issues Thomas Jefferson spoke of, were made part of the operating government we know today. Are we faced with problems? Yes. Are they as severe as what they were faced with? Well, only you can be the judge of that. There is no doubt that George Washington loved his country, and there is no denying that he was concerned for America’s future. Those sentiments were often shared in the letters he wrote. One particular person whom he wrote to often was James Madison. On March 31, 1787 George Washington wrote to James Madison, just two months before the Constitutional Convention would begin. They hoped this time things wouldn’t fail as they did a year earlier. It was at that time, when only twelve men from five states were in attendance to amend the Articles of Confederation. The Articles of Confederation was a great starting block at the start. However, as Washington understood, they were not perfect. They needed to be amended, and it was hoped that during the Constitutional Convention representatives from each of the states would be in attendance, and that progress would not come to an end. It was in Washington’s letters where he would often share his thoughts and concerns, and those to James Madison were of no exception. James Madison, as we know, was extremely influential in the writing process of the Constitution. This letter is a good example as to the what weighed on George Washington’s mind. He feared that if things remained, those things that brought this country together would be what would drive the states apart. So, his opinion was that a small federal government that brought the states together would prevent that. 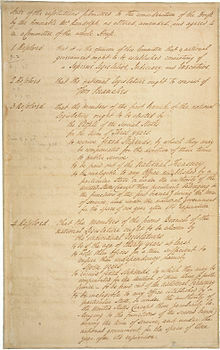 It was necessary, as Washington thought, that the states work together to help form this limited role for government. In this letter, George shared with Madison that he saw the eventual Constitution as one to “be looked to as a luminary, which sooner or later will shed its influence.” If only Washington were alive today to see where we have come and the things we have done.